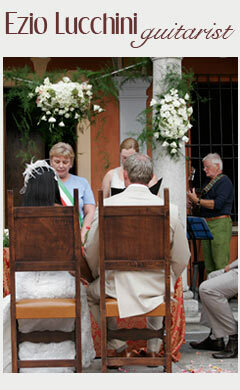 Classical guitar is an excellent choice for your wedding ceremony as it offers a wide array of musical repertoire. Baroque, classical, Latin American/Spanish and popular modern arrangements can be woven together to make your wedding music flow seamlessly. Ezio Lucchini is a professional classical guitarist based in Lake Orta, providing live music for events across the Italian Lakes Area from weddings to corporate events to full concert performances. Let the timeless, graceful beauty of the classical guitar and its music enchant you and your guests. With over 30 years experience and a deep lifelong dedication to guitar music, Ezio Lucchini can add a special touch of magic to your special day. An accomplished guitarist in many styles from classical and spanish to jazz and pop classics, Enzio can tailor his performance to your requirements with the flexibility to create various moods: a sophisticated ambience for dinners and low key events, rhythmic styles for a lively atmosphere, or beautiful renditions of traditional wedding music to accompany the various stages of the wedding ceremony. His wedding music repertoire is very beautiful, sensitive, polished, and heartfelt. He is known for his skill in arranging pieces for solo guitar and for the depth of feeling expressed in his playing. Ezio performs for weddings and special events large and small, indoors or outdoors. From the most sophisticated of weddings and other special occasions to the more casual, Ezio Lucchini's guitar music will add elegance and help create a warm, uplifting, ambiance that relaxes, uplifts, and opens hearts. Ezio Lucchini Classical Solo Guitarist serves the following cities and wedding venues: Como, Villa Del Balbianello, Villa dei Cipressi, Varenna, Villa d'Este, Bellagio, Varenna, Cernobbio, Verbania, Pallanza, Villa Rusconi Clerici, Stresa, Villa Muggia, Castello Dal Pozzo, Locarno, Villa Volpi Ghiffa, Orta San Giulio, Orta Town Hall, Villa Bossi, San Rocco Hotel, Villa Crespi, Castello di Miasino, Hotel Approdo and Antica Colonia in Pettenasco.